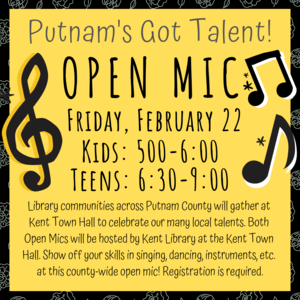 Library communities across Putnam County will gather at Kent Town Hall to celebrate our many local talents on Friday, February 22. The event for kids 8-12 will be open from 5:00-6:00, and for teens from 6:30-9:00. Both Open Mics will be hosted by Kent Library at the Kent Town Hall. Show off your skills in singing, dancing, instruments, etc. at this county-wide open mic! Registration is required.